Background: This discussion took place on November 14, 2012 between Margaret Bell, Andrew Castillo, Katherine Marshall, Michael Bodakowski, and Ariel Gleicher via conference call, as part of a joint review of a Habitat for Humanity International (HFHI) interfaith pilot by the World Faiths Development Dialogue and HFHI. The interview is a component of the larger evaluation and a series of interviews that form a baseline. Tom Jones, ambassador-at-large and senior leadership team member of HFHI spearheaded the initiative following a 2008 workshop on faith and shelter at Georgetown University. In this interview, Andrew Castillo and Margaret Bell describe the background of the Habitat Metro Denver Affiliate and its engagement in faith relations for the past eight years. They emphasize the presence of strong Christian, Muslim, Jewish, and Religious Science communities. Their hope is that through the implementation of the Interfaith Toolkit they can focus more sharply on educating the diverse communities on the importance of trust, respect, and collaboration between religious traditions. In their effort to spread this message, Habitat Metro Denver is facilitating a "Hope, Faith, and Home Build, a Clergy Build," and a Global Village build in Nepal, among other efforts. They envision a substantial work program but believe that use of the Interfaith Toolkit will enable them to further the goals and mission of their Habitat affiliate. While the toolkit is important, innovation based on local circumstance is equally important. Could you tell us something about yourselves and how you came to your current position? Margaret Bell: I first volunteered with Habitat in 1987, so Habitat has always been near and dear to my heart. I now serve as the faith relations manager here at Habitat Metro Denver, and I have been in this role for about two years. I literally felt called to this position. My husband is a Presbyterian minister which brought us to Denver. We had lived before in Columbus, Georgia and Knoxville, Tennessee, and I did quite a bit of not-for-profit volunteer work as well as some paid assistance with nonprofits. I was a national pilot site program manager for Uniting Congregations for Youth Development, work that has served me well in my Habitat position. The program was conducted through the Search Institute, which partnered with other organizations to fund a huge national program. When I was in Columbus, Georgia I wrote the grant to participate in the program, and we were chosen as one of the seven sites across the country. I served as the site coordinator. It was a very interesting way to see Columbus, Georgia. We pulled together different socioeconomic mixes of congregations who agreed to meet together over a period of three years and look at how they were serving youth in their congregations. That was a unique experience, one that I absolutely adored. With that background, when this faith relations manager position here at Habitat became available it seemed a great way to continue that work with adults and through a hands on model. 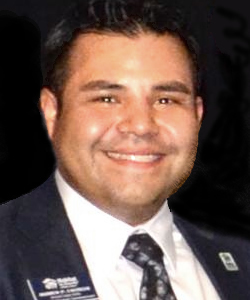 Andrew Castillo: I have been involved consistently in volunteering for the last 12 years as a mentor, tutor, athletic coach, and at homeless shelters and food banks. When I was growing up I would volunteer here and there with my mother and my family. Early in my professional career I was in the corporate circuit, also volunteering in my free time. I began to question which experiences I really enjoyed and decided that I did not want to stay on a corporate path, so I went back to school and got my B.S. in human services with a concentration in nonprofits. I felt that I could bring about change, both personally and for communities. I also believed that in order to make that change I needed to become more educated so I could be involved beyond volunteering. I interned at the Catholic Charities Archdiocese of Denver and then moved on to intern at Habitat Metro Denver. It was these two internships that helped me decide which direction I really wanted to go in the nonprofit sector. I knew while I was pursuing my degree that I wanted to be able to express who I am as a person and to be working somewhere where I could be fully committed to the mission. For me, Habitat is the place for me to do that. This is especially true of the Interfaith Toolkit Project. This project is why I decided to stay with Habitat in my Americorps work. My decision was not about the pay or anything else. It was about where I wanted to be and how I could help Habitat continue their mission. I wanted to be able to help both locally, also knowing that it is a pilot, so that it will have national benefits. It is an honor to say that I have my hand in this effort. It is a win-win for me. What does your work involve, both day-to-day and the strategic framework that shapes your activities? In our strategic plan we are hoping to serve 500 more families over the next five years. We know that this is a bit aggressive, but we hope to accomplish it through our traditional home building model as well as our new neighborhood revitalization initiative. The goal of this model is to help keep families who might not otherwise be able to afford to do so in their homes. We will do projects like help repairing the roof, replacing the windows, weatherization, and other similar efforts. All of our repair projects are exterior only, so we do not have to cross the threshold of the home to do the repair. We are also trying to do rehab. In this model, we buy a home that is due for foreclosure or other circumstances. We then rehab that home and put a new Habitat family partner in the house. What are the size of your Habitat affiliate and history of its faith engagement? We will be celebrating our thirty-fifth anniversary as an affiliate next year, and this past Saturday we celebrated the completion of our five hundredth home. Including our ReStores, administrative departments, and build staff we are about 70 people on staff. Habitat Metro Denver is an affiliate that has had a full-time faith relations position for the past eight years. Our faith community here is very supportive of our work. We have nine faith coalitions or groups of coalitions who work to raise the funds and provide the volunteers on an annual basis. We have approximately 140 congregations who partner with us on a regular basis. ReStores are part of the Habitat model here. We accept any donations or building materials that are related to housing building or maintenance. We then sell the materials to the public at an 80 percent discount. The funds of those three restores basically cover our fundraising and administrative costs. There are 30 affiliates in the state of Colorado. The north border of our territory bumps up to an affiliate called Flat Iron. On the west we border Habitat Blue Spruce and to the south we border Habitat Colorado Springs. We are by far the largest affiliate in Colorado and our five counties of territory cover quite a bit of area. South and southeast Denver are what we would consider the affluent corridor, where Habitat simply could not afford to be in terms of building and repairing homes. This stretch makes our coverage look a bit bigger than it is. We do, however, hope to include another ReStore or donation center in that area. What are the most pressing housing issues in your city or county? What are the main obstacles that you as an institution are focusing on as the problem? The need here in Denver, in terms of safe, decent, affordable housing, is very different from other cities in the nation. The northeast neighborhoods are primarily high-density high-rises, and the south is crumbling shacks. The need there is far more likely to be sub-standard apartments with inadequate insulation or very unsafe neighborhoods. The most common situation here is families who are working two or three jobs but are still paying between 40 to 50 percent of their income on rent for housing that is not safe and not affordable. We need to address and explain these needs, because they are not always obvious. It is a matter of us being responsible and getting those stories and statistics out into the public. One in every four children in our community lives in poverty or in unsafe situations. To illustrate the impact of our programs, we were delighted by a positive response to a recent homeowner survey. As of December of last year we had 468 families partnering with us and living in Habitat homes. We reached out to each of them for our homeowner’s survey. With each survey we included two dollars and a self-addressed, stamped envelope, as a way to recognize that it would take some time for them to complete the surveys and that we appreciated their participation. Almost all of the surveys were returned with the two dollars included and sometimes with even more money saying, “Habitat has made such an impact on my life, I want to contribute to your work with other families.” The results of that survey told us that children of Habitat family partners were twice as likely to go to college as those who had not partnered with us. This is an example of how we are developing useful tools to share the stories and the need for affordable housing. Since 2000, 128 of our homes have been fully sponsored by faith communities. I am proud of these numbers, but there is also so much more to be done because there are many congregations that are not connected to our work yet. One element of the toolkit that I was a bit hesitant about was how we would be able to integrate the tight-knit Muslim immigrant population that is growing here. The majority of them come here from Morocco or Northern Africa, as well as from Iran and Iraq. They are very connected to one another, and when we have been able to get them involved we have seen a great deal of support from their community. On the other side of the spectrum, we have the Habitat Interfaith Alliance, which is made up of four Jewish congregations, Universalists, Episcopalians, and Christians. For one recent project they partnered with a Muslim family from Somalia. The home dedication was last August, and it was during Ramadan. The event was taking place at 4:00 p.m. in the afternoon, which was during the fast that the family was observing. This family, which had survived the famine in Somalia, insisted on preparing a gorgeous spread of food for the folks who had worked on their house even though they would not be able to eat the food until after sundown. A rabbi, an imam, and a Protestant minister all spoke at that dedication. It was a beautiful experience that really brought people together. We need more of that to come out of this Interfaith Toolkit. Here in Denver there are very strong Catholic and Lutheran communities, as well as a significant Muslim community. We know that there are also Buddhist, Hindu, and Sikh congregations in much smaller proportions. We decided to target the Muslim, Jewish, and Christian populations in our House of Abraham build because we wanted to have a strong foundational thread that would tie the groups together. Starting with these three, we want to be able to widen our reach to all of the other communities that are also here. Why did you decide to take part in the Interfaith Toolkit Project? What are you hoping will be the result? We saw the toolkit as a way to build upon current partnerships and expand to different faith groups. We are fortunate that we already have a very strong Jewish support base, alongside just about every Christian denomination that you can imagine. This includes Religious Science and Mennonite partners. We have also successfully partnered with Muslims on the family partner dimension. We saw this pilot as a great way for us to discover how to partner further and include the Muslim community in the other dimensions of our work as well. Are you working with interfaith groups in your region? We are partnering with the Abrahamic Initiative, which has been around for 13 years. They put on quarterly dialogue events that emphasize building trust and respect among groups. We have established great connections with them and are starting an educational series with them titled, “A House of Hope: Faith and Home Series.” They are an important partner because they already have ties in the community to pull in influential speakers and panelists. We have also been in contact with the Interfaith Alliance of Colorado. Their vision focuses primarily on public policy and social justice issues. This is an important aspect of our work so as we continue to cultivate a partnership with them, we will see how we can effectively support one another. Our partnership will mostly involve referring families to one another when they need the help of either organization. There is also the Multicultural Mosaic Foundation. We have been speaking with their president, Ishmael, and have attended some of their dialogue panels, which are conducted in a similar format to the Abrahamic Initiative. They are eager to engage and partner. The more that we engage in community efforts, the more familiar they become with our mission and more interested in working together. What is the involvement of the Hispanic community with your affiliate? The Hispanic community in Denver represents a relatively small portion of the Habitat partners. I would say it’s about a third of our partnerships. The majority of Hispanics here in Denver are practicing Catholics. We spoke to the Archdiocese of Denver and their director of social ministry, who noted that many Catholic churches are on hold because they are awaiting a new archbishop (his predecessor was transferred to Philadelphia). The new archbishop is now slowly transitioning into his role. Once his plans are clear, we hope to find out how Habitat can be more involved, and that will be our entry into getting the Hispanic community more involved. How far do you aim to reach in terms of faith communities? We welcome all denominations, but we also recognize that not every person who comes to partner with Habitat is the fit for our model. In that same way, not every congregation that comes to partner is the right fit. We have a very strong non-proselytizing statement, and we make sure that every congregation understands this. We do have a few congregations that want to partner with us, but not with other congregations. While we are fine with that, we are clear that on build days and on-site, this effort is not about converting others to their own religion. Here in Denver the Mile High Church of Religious Science is one of our largest congregations; I believe they have about 8,000 members. They do not have the traditional Christian background, but rather they want to do good because the universe requires it. They worship the science and connectedness of all beings and all things and believe that what is good for one is good for all. We also have a Church of Unification or Scientology in the area. They are not yet involved in our efforts, but they have expressed interest and want to start talking about partnering. Thus far have there been any tensions between faith groups that you have witnessed? One situation that I hope to eradicate during my time here in Denver as faith relations manager involves the relationship between certain congregations and our Muslim partner families. When I go to these congregations at the end of the year to pitch our potential builds for the upcoming year, their response is sometimes that they would rather build for a family with two parents and someone native to the United States. What they are really saying is that they do not want to build for a Muslim family that is not from the United States. These situations really break my heart, and they are why I am so hopeful that this Interfaith Project will help us avoid that dynamic. One way that we can address this type of issue is through education and awareness-raising efforts. It is important for our faith partners to know how the Habitat process works. We must communicate when the panel selects the family they do not know the family’s demographic or religious beliefs. At Habitat we choose our family partners based solely on their need. It will be important for the coalitions to understand this. We decided to start with the Interfaith Clergy Build because we thought it would be great to have the clergy involved themselves and to give volunteers a great example of service. Then we decided to do a “Laugh in Peace Comedy Tour.” This was a dual performance between a rabbi named Bob Alper and a Muslim named Azhar Usman, and we sold tickets to the event. We thought it would be a great way to bring people together, to laugh together, and have people in a worship space for another purpose. Everyone loved it, and we felt it was a great way to start to establish the trust, the respect, and the safety that are needed for people to feel comfortable partaking on a build together. Our “Faith and Home” series will start in January. We will lay the foundation for our “House of Hope, Faith, and Home” at the start of this series. There will be a lecture format with an imam, a rabbi, and a minister who will each speak about what their faith tradition says about homes and hospitality. We want them to speak about their role on these topics as faith leaders and then what that looks like for them personally. In February we will put up the walls of the “faith home” at the Northeast Denver Islamic Center. We will have a panel format with a moderator, a Jewish leader, a Christian leader, a Muslim leader, and a Habitat homeowner. Each member will discuss his or her faith and their understanding of home and hospitality. Then in March we will put on the roof of the house and have a roundtable discussion at Temple Emanuel, a large Jewish temple, with a moderator and a group of seven or eight individuals. Each person will have the opportunity to talk about their relationship with home and hospitality and how their Habitat experience has changed their understanding of that. Our House of Abraham Interfaith Build begins on Thursday, January 31. We will build on Thursdays, Fridays, Saturdays, and a few Sundays. The build will continue until Saturday, April 13. This is all our faith in action piece of the pilot. On the advocacy piece, Habitat Metro Denver is a tithing affiliate. We send $4,500 abroad for every home that we build here in Denver. This year we are slated to build 38 homes, and next year we plan to build 40. That means that our tithe budget is around $160,000 this year. We have partnered with four countries abroad to be their tithe partner for three years, from 2012 to 2014. Habitat International has neatly divided the world into four sections, and we have chosen one partner in each of the four: Kenya, Macedonia, Nepal, and Nicaragua. Through the pilot project we would like to plan a Global Village trip to Nepal next fall. We would take a group of Jewish, Christian, and Muslim volunteers to build in Nepal for either a Hindu or Buddhist family. This will be the icing on the cake of our pilot. We want to demonstrate how Habitat can be the vehicle to provide for housing needs globally. This way our partners can see the ripple effects of our work, and it will be the role of advocacy to take that story and move it forward. Could you speak in some more detail about the focus of your chapter’s advocacy work? Advocacy is sometimes a tricky thing in the faith community because of the separation of church and state. With that in mind, it is more a matter of relationship-building. We want our faith communities to be able to get to know our family partners and to establish relationships with them. We want to have both our families and our faith communities feel comfortable telling the Habitat story and their transformation. I think that if we can do that then that will be effective in the advocacy component of this pilot project. We have also found that communities really go with what their faith leaders say on these issues. We held an Interfaith Clergy Build, with leaders from nine different faiths represented. It was great to see each of these religious leaders interacting and doing what they felt they needed to through their faith. We hope that they will share those experiences with others in their congregations. What is it that you want legislators and city leaders to do? Is that part of your advocacy plan? Habitat Colorado is the affiliate that advocates on a state level for all of the other 29 Habitat affiliates in the state. They do not build themselves, but they help with statewide grants that come in and need to be disbursed. They are our advocacy and governmental relationship agency. We also have an advocacy team here in our affiliate, but we rely a fair amount on Habitat Colorado to let us know when we need to get the word out, contact our legislators, or show up on Capitol Hill. With this dynamic already in place, I am not sure that I see Habitat Metro Denver being very involved other than making sure that the information is spread more widely. At this point when Habitat Colorado identifies an issue to be addressed, we do not usually share that information with our donors or our volunteers. Part of the reason for that is that we are very careful to not to be seen as political. Do you make special efforts to engage children and women who are not traditionally involved in these activities? There is a requirement that you have to be 16 years of age to build on a Habitat site. One of our initiatives is called Youth United, which is lead entirely by youth of high school and college age. We are working to incorporate the interfaith piece in this effort. We also have several colleges and universities in Denver that we have reached out to. We have a “Collegiate Challenge,” where students go on their spring breaks to build homes. We host a number of those trips, and we are working to add an interfaith component to those builds as well. We also have a Women Build every year that has been in place for at least the past eight years and probably more. We have a very strong contingent of female volunteers. One of the imams said, “I don’t know how the women in our congregation will come out and build in a hijab.” I showed him pictures of the many times in the past that we have had female builds. We also engage women and youth who are uncomfortable on the build site to be involved at our ReStore locations. We are very conscious of having women clergy represented as well as males. We have an Inclusivity, Diversity Task Force also that we are working with to integrate the interfaith piece. The timing of the pilot is great for us. We had many mechanisms in place coming into the project. We already had our Building on Faith Committee in place, which consists of one representative from each of our faith communities who come and meet with us monthly. We also have a Clergy Advisory Council, which meets every other month. This is the group that we decided to use as our Interfaith Pilot Project Steering Committee. At this point, we have one or two imams, three rabbis, and a strong contingent of Presbyterians, Methodists, Lutherans, Religious Scientists, and Universalists. It is a group of about 18, and we hope to add senior clergy representation. I envision it being as many as 24 in the end. Do you have any feedback on the toolkit? It is great to have something to start from. My one frustration is that we have hemmed ourselves in too much by trying to stick to universal outlines and principles. I know that you have to start somewhere, but I wonder if the amount of creativity and diversity would be more accessible without trying to stick so closely to the toolkit that we are testing. I would like to see the testing be able to go beyond what we already have on paper. If you were asked now how someone should evaluate whether you’ve been successful come July, what would be a reasonable way to measure and make that judgment? In many ways the pilot project is already a success because it has enabled us to reach out to the community and partner with so many congregations. We have already had such strong buy-ins, enthusiasm, and excitement, so in that sense we are already successful. As an Americorps VISTA volunteer there is a requirement that my application includes quantitative goals for each element of the project. One of the items included was the number of community members and contacts who were reached. In the original application we set a goal of 45, but this was updated because we have already made 86 connections through partnerships and networking. Another example is that we reached out to a local imam, and he said, “I already know the mission of Habitat, but what is the mission of the pilot project?” He attended the Interfaith Clergy Build. One thing that we do at these events is to have a room set up for each participant for their prayer time. As the time for prayer drew near, this particular imam said, “With everything that is going on right now and interfaith interactions, I don’t want to miss what is going on here, and I will postpone my prayer.” That is the kind of energy and interaction that is difficult to paint on paper, but to be there and to see that was a clear measurement of the success of our work. This imam is now very involved and committed to getting his community involved.